Download Google Play Store APK - New Google Play Store starting to get a touch of Materials Design, we know that the material design will be the hallmark of the Google Android L later. 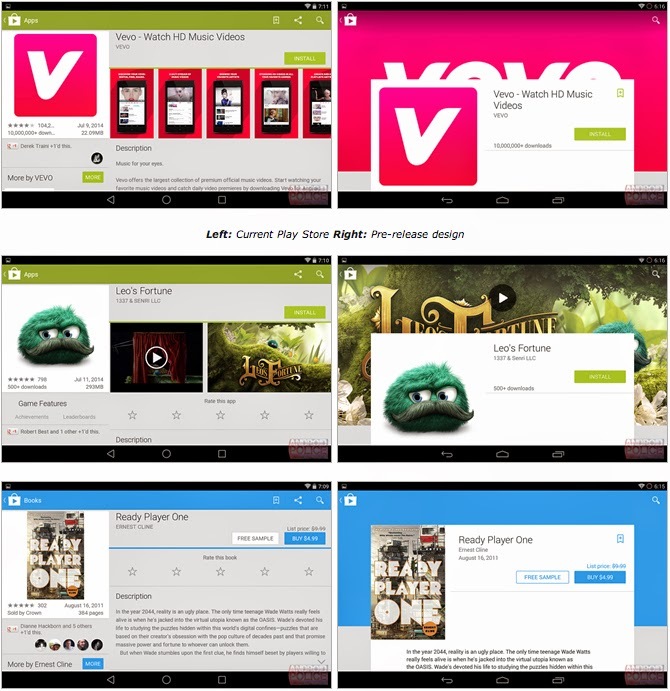 With the use of automated material design each view will be different from the old Play Store display. It looks completely new, transition effects and animation too. There are also new icons that decorate the layout of Google Play Store 4.9.13, such as icons rating, genre, and similiar icon (to bring up the relevant application page). To read a description of an application, now you have to press the Read More link located above the thumbnail. When you scroll the screen up when in the description page, you will be taken back to the previous page with interesting animation (typical Material Design). As normal, you can wait for the automatic update Play Store application for your Android device (can be checked via the Settings> tap on Build version). If you do not want to wait any longer, please download the Google Play Store 4.9.13 APK through the link provided below. Any question? Please comment bellow.